Whether it’s sculpture and ceramics or furniture design and manufacturing, the exhibit shows how the modern movement comes to think of it all as “one act of making.” Part of the way the exhibit highlights this is by showcasing furniture and ceramics alongside sculpture and prints, and also drawing attention to the pieces’ production in North Carolina as part of the artistic process. The exhibit also examines a transatlantic conversation between European modern designs and American. As many Europeans migrated to America, they brought Bauhaus and European design influence with them to schools like Black Mountain and Cranbrook. Edwards placed groups of chairs opposite one another to show that influence and highlight differences. St. Louis Art Museum took a note from midcentury marketing by teaming up with department stores patrons to host design competitions in which the winning designs would be produced and then sold in stores. Photo by Patricia Rose Kilbride. St. Louis Art Museum’s St. Louis Modern exhibition also showcases the relationship between museums and the production of midcentury designs. Museums, such as the St. Louis Art Museum, teamed up with local department stores to host design competitions in which the winning designs would be produced and then sold in stores. The Museum of Modern Art in New York (MoMA) hosted famous examples of this during the modern period. As Cortinovis explains, “MoMA aimed to connect modern designers with manufacturers and retailers, so they were helping them get to the next step of not just conception but production and sales.” While the arrival of World War II interrupted MoMA’s first initiative, the Organic Design in Home Furnishings competition, “this sympathetic relationship between retailers and museums flourished in the post-war period.” she says. This “cross-pollination” between art and commerce that involved designers, museums and retailers throughout the period illustrates this shift in thinking that came to embrace commercial, household items as an art form. Even in the retail stores, Cortinovis observes, sometimes the products were displayed similarly to the way they might be in a museum, with information about the artist and designs. Front and center shows a Saarinen Pedestal table and Tulip chairs with Russel Wright ceramics. This is on loan from the Gregg Museum of Art & Design and was adapted from the arrangement by curator Matthew Gay. Along the wall to the left and in the back of this gallery, Edwards explains that they emulated Alexander Girard’s wallpaper “dashes.” Along the platform from left to right: Gilbert Rohde desk, white Hansen chair, yellow chair from North Carolina designer Marie Wesman, Bertoia Diamond chair, Bertoia Sunburst sculpture, Barcelona chair, Knoll table, and Perriand and Le Corbusier chairs that are upholstered in animal hide. Photo by Wendy Huang. The St. Louis Modern exhibit features several winners from such competitions. A woven chair that is on display won the Museum of Modern Art’s organic design competition and is unique because of the designers’ connection to the Bauhaus and Mexico. Additional rare and interesting competition winners are printed textiles from a formerly St. Louis-based female textile designer who had a wide-ranging and successful career producing on a small scale. Her printed textiles won a competition sponsored by the Springfield Museum of Art. 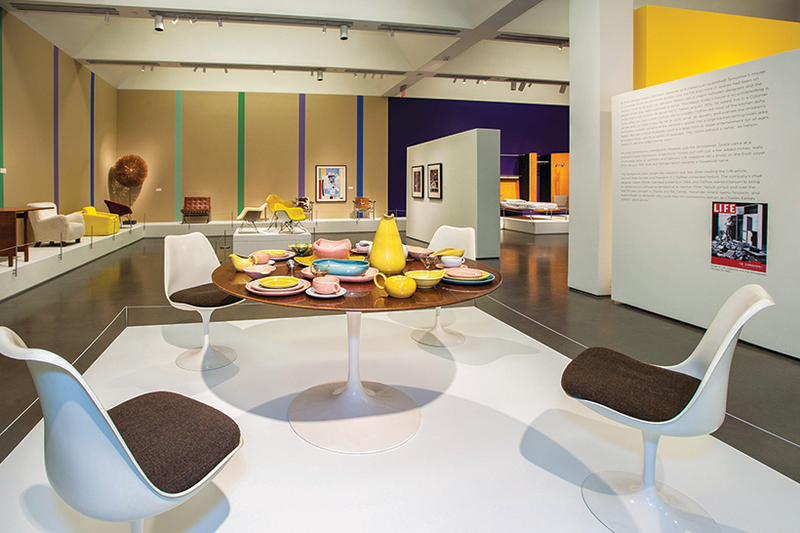 This exhibit also has a local focus highlighting St. Louis’ connection to and embracing of Midcentury Modern design. 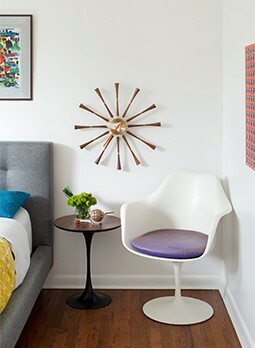 Charles Eames is from St. Louis, for instance, and the city is also home to Eero Saarinen’s world-famous Gateway Arch. Local architects like Charles King and Robert Elkington fully embraced Midcentury Modern design in their architecture and also in their homes’ furnishings. 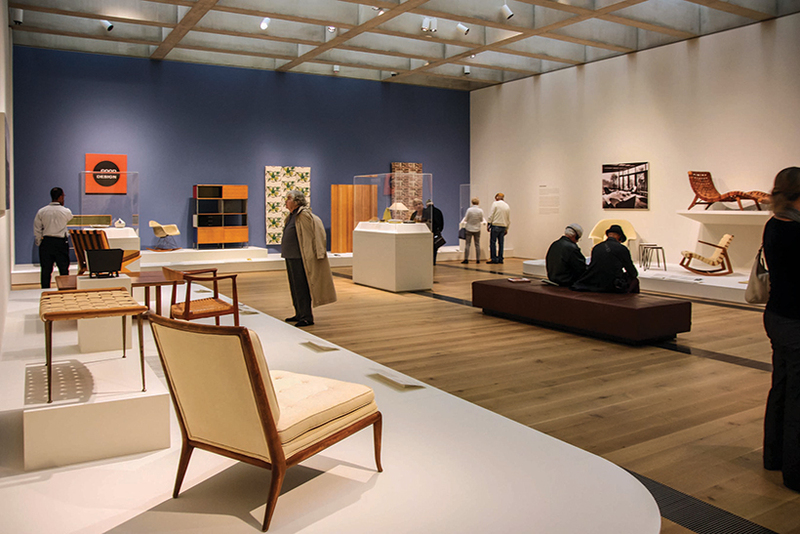 Parts of the exhibition are designed to evoke their homes’ interiors to show how they, too, played a role in St. Louis’ embracing of Midcentury Modern design.